Download "Tips for doing well on the final exam"
1 Name Date Block The final exam for Geometry will take place on May 31 and June 1. The following study guide will help you prepare for the exam. Everything we have covered is fair game. As a reminder, topics include (but are not limited to): Logic Parallel lines and transversals Triangle basics and congruence Triangle similarity Right triangles, including Pythagorean theorem and trigonometry Polygons, including properties of quadrilaterals Circles Transformations Area of polygons Surface area and volume of solids Constructions Tips for doing well on the final exam: Answer EVERY QUESTION on this study guide, even if you think you already know it. Use your notes and other resources to find the answer to questions you do not know. Make an effort to find the answer yourself before asking for help. SHOW ALL WORK. You may lose points on the exam if you do not do this!! Showing work means making appropriate substitutions and writing down all steps when solving a problem. Use your time wisely. Answer all questions you know first, then go back and work on the ones you do not. Use your scratch paper wisely. When the test begins, write down formulas you have memorized that are not on the SOL formula sheet. Important formulas to know: Δy y 2 - y 1 o Slope: m = = Δx x 2 - x 1 o Slope-intercept form of a line: y = mx + b o Point-slope form of a line: y y 1 = m(x x 1 ) o midpoint: ( x1 x2 2, y1 y2 2 ) o distance: (x x2) (y1 y2) Breathe! If you ve prepared, feel confident! 2 Practice questions: 1) In your own words, describe inductive reasoning: Geometry Final Exam 2012 Study Guide 2) In your own words, described deductive reasoning: 3) Every multiple of 2 is even. 256 is a multiple of 2. Therefore, 256 is even. a) The statement is an example of reasoning. b) The statement uses the law of. (detachment or syllogism) 4) Every Friday, we go to a restaurant for dinner. Today is Friday. a) What is a logical conclusion? b) The reasoning used to make the conclusion is the law of. (detachment or syllogism). 5) Every Friday, we go to a restaurant for dinner. If we go to a restaurant, we get dessert. a) What is a logical conclusion? b) The reasoning used to make the conclusion is the law of. (detachment or syllogism). 6) Given the statement ~a ~b a) Write the converse of the statement b) Write the inverse of the statement c) Write the contrapositive of the statement 7) Draw an Euler diagram for the following situations: a) Some dogs are floppy-eared. 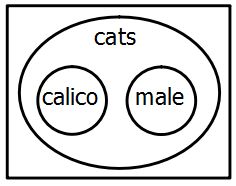 b) No cats are calico and male. c) All parallelograms are quadrilaterals. 8) Decide which statements are bidirectional: a) If two angles are vertical, then they are congruent. b) If a quadrilateral is a square, then it is a rhombus. c) If two lines are parallel, then corresponding angles are congruent. d) If a triangle is equilateral, then it is isosceles. e) If an angle measures 90 o, then it is a right angle. 4 13) Fill in the reasons for the proof: Given: AB CD; AB CD Prove: A D Statement: Reason: 1) AB CD; AB CD 1) 2) ABC DCB 2) 3) BC BC 3) 4) ABC DCB 4) 5) A D 5) 14) Given the figures, what theorem can be used to prove the triangles congruent? a) b) 15) Find x give the triangles are similar. 16) Which similarity theorem can be used to show PRQ~ SRT? 17) Given: PQ BC. Find QC. 5 18) Find the measures of the numbered angles in the parallelogram. 19) What is the smallest possible integer value for n for the triangle at right? 20) Two sides of a triangle measure 8 and 12. Describe the range of possible valid values for the third side. 21) Find the values of the variables. a) b) 22) Given the triangles are similar, find the values of the variables. 23) In the diagram, AB DE, A D, and B E. What theorem/postulate can be used to prove ABC DEF? 6 24) Given the figure, m BCD = 6x+2, m BAC=3x+15, and m ABC = 2x - 1. What is the value of x? 25) In the diagram, ABC~ DEF. Find the value of x. 26) A garden is represented in the figure at right. What is the length of the walkway? 27) A tree casts a 25-foot shadow on a sunny day. If the angle of elevation from the tip of the shadow to the top of the tree is 32 o, what is the height of the tree to the nearest tenth of a foot? 28) Find the measures of angles A and B to the nearest tenth of a degree. 29) In right triangle ABC, AB = 20, AC = 12, BC = 16, and m C = 90. Find, to the nearest degree, the measure of A. 7 30) As shown in the diagram below, a ladder 5 feet long leans against a wall and makes an angle of 65 o with the ground. Find, to the nearest tenth of a foot, the distance from the wall to the base of the ladder. 31) Write an equation of a line that passes through point (1, 4) and is parallel to the line y = 2x ) Write an equation of a line that passes through point (3, -2) and is perpendicular to the line that passes through points (4, -3) and (-10, 4). 33) What is the measure of an interior angle of a regular pentagon? 34) What is the measure of an exterior angle of a regular nonagon? 35) An interior angle of a regular n-gon measures 150 o. How many sides does the polygon have? 36) A playground in a local community consists of a rectangle and two semicircles, as shown in the diagram. What amount of fencing, in yards, would be needed to completely enclose the playground? Express your answer in terms of π. 37) What is the area of the figure, to the nearest square centimeter? 8 38) The diagonals of a square are 10 feet long. What is the area of the square? 39) Find x in simplest radical form. 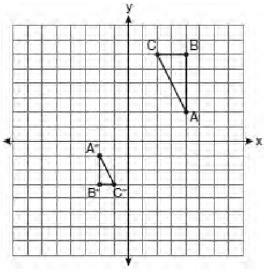 40) In ABC, C is the right angle, A = 32, and AC = 10 feet. Find BC to the nearest hundredth. 41) The given circle O has radius r. What is the length of OB in terms of r in simplest radical form? 42) The area of a square is 18. What is the longest straight line that can be drawn between any two points of the square? 43) Write the standard form of the equation of the line passing through the point (5, 2) and parallel to the line 2x 3y= 6. 44) In the figure, AB DC. What are the measures of A and B? 45) Find x. 46) What values of a and b make the quadrilateral a parallelogram? 9 47) In the rhombus shown at right, m CBE=60 o and BC=12. Find the area of the rhombus in simplest radical form. 48) Isosceles trapezoid ABCD has diagonals AC and BD. If AC = 5x +13 and BD = 11x 5, what is the value of x? 49) The diagonals of a rhombus are 10 and 24. Find the perimeter of the rhombus. 50) In quadrilateral PRST, the perimeter is 49. PR = x, RS = x + 3, ST = 2x + 4, and TP = 3x. Find the length of the shortest side of the quadrilateral. 51) EF is the median (midsegment) of trapezoid ABCD. If EF = 25 and AD = 40, find BC. 52) The measures of angles A and B of parallelogram ABCD are in the ratio of 2:7. Find the m A. 53) The opposite sides of a parallelogram are represented by 2x+10 and 5x-20. Find the length of the side of the parallelogram represented by 4x-1. 54) In the given diagram of a parallelogram, m 1 = 45 o and m DCB = 120 o. What is m 2? 55) Line segment AB has endpoints A(2, -3) and B(-4, 6). What are the coordinates of the midpoint of AB? 56) In circle O, a diameter has endpoints (-5, 4) and (3, -6). What is the length of the radius, to the nearest tenth? 10 57) Point M(2, 1) is the midpoint of segment AB. If the coordinates of endpoint A are A(7, -1), find the coordinates of endpoint B. 58) What transformation is shown in the diagram? 59) Two transformations were performed on ABC to form A B C, shown in the diagram. Name the two transformations. 60) ABC has vertices A(-2, 2), B(4, 2), and C(1, 6). Is the triangle isosceles, right, equilateral, or scalene? 61) Trapezoid NATS has vertices N(-5, 0), A(5, 0), T (3, 3) and S (-3, 3). Is the trapezoid isosceles? Explain why or why not. 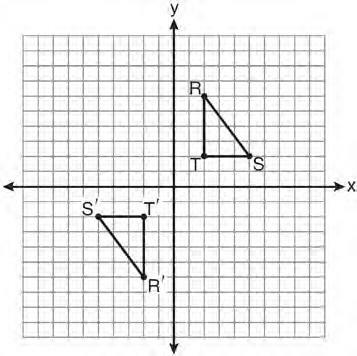 62) What is the image of point A(4,2) after rotating it 90 o and then reflecting it over y = x? 11 63) On the set of axes shown, Geoff drew rectangle ABCD. He will transform the rectangle by using the translation (x, y) (x+2, y+1) and then will reflect the translated figure over the x-axis. What will the area of the rectangle be after these transformations? 64) The endpoints of segment AB are A(3, 2) and B(7, 1). If segment A B is the result of first transforming segment AB by translating it by vector <-4, 3> and then dilating it with scale factor 2, what are the coordinates of A and B? 65) The point (3, 2) is rotated 180 about the origin and then dilated by a scale factor of 4. What are the coordinates of the resulting image? 66) How many lines of symmetry do the figures have? a) b) c) d) 67) a) Name uppercase English letters that show vertical line symmetry b) Name uppercase English letters that show horizontal line symmetry c) Name uppercase English letters that show both horizontal and line symmetry at the same time. 68) Circle O has radius OC with length 5 cm. Chord AB is 8 cm and is perpendicular to OC at point P. What is the length of OP in centimeters? 12 69) What transformation is shown that transforms RST to R S T? 70) In the diagram, circle O has a radius of 5, and CE = 2. Diameter AC is perpendicular to chord BD at E. What is BD? 71) Tangents PA and PB are drawn to circle O from an external point, P, and radii OA and OB are drawn. If m APB = 40 o, what is the measure of AOB? 72) Fill in the missing reasons for the proof: Given: PA and PB are tangents to circle O; OA and OB are radii of the circle. Prove: PA PB, APB BPA, POA POB Statement: Reason: 1) PA and PB are tangents to circle O; OA and OB are radii of the circle 1) 2) PAO and PBO are right angles 2) 3) PAO PBO 3) 4) PO PO 4) 5) OA OB 5) 6) POA POB 6) 7) PA PB, APB BPA, POA POB 7) 73) In the diagram of circle O, chords AB and CD intersect at E. What is the measure of arc BD? 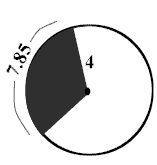 13 74) In the circle shown, the measure of arc QT = 140 o and m P = 40 o. What is the measure of arc RS? 75) In the diagram of circle O, chords AB and CD intersect at E. If CE=10, ED = 6, and AE = 4, what is EB? 76) In circle O, diameter AB is perpendicular to chord CD at point E, OA = 6, and OE = 2. What is CE in simplest radical form? 77) Find m RAD. 78) In the diagram of PAO, AP is tangent to circle O at point A, OB = 7, and BP = 18. Find AP. 79) Find the value of CD if AB = 8, BC = 10, and CE = 12. 14 80) In circle O, the measure of arc BC = 50 o. What is the measure of BAC? 81) Find the value of x. 82) A circle is divided into six equal pieces (slices). The area of one of the regions is 6π. What is the circumference of the circle (answer in terms of π)? 83) Given circle O where chord OC is perpendicular to chord AB. If the radius of the circle is 17 and OC = 8, find the length of AB. 84) In circle O, AB = CD and the segments are perpendicular as marked. Find x. 85) In the figure, AC is a diameter, and the length of arc AB is 3π. What is the area of the circle? Answer in terms of π. 86) AB is tangent to circle O at A (not drawn to scale). Find the length of the x. 87) Segment AP is tangent to circle O. Find the value of x if PB = 3 and BC = 9. 15 88) Line RB is tangent to circle A at point B. BD is a diameter. Find m CBR. 89) In the figure, line AB is tangent to circle O at point A. The measure of arc AC = 70 o and the measure of arc CD = 110 o. Find m ABC. 90) In the circle, the measure of arc PR=140 o and m RPQ=50 o. Find the measure of arc PQ. Then find the m PRQ. 91) Find the area of circle C. Answer in terms of π. 92) The circle has a radius of 4. The length of the arc of the shaded part of the circle is Find the area of the sector. 16 93) Find the area of the shaded sector of circle O. The radius of the circle is 6 inches, and the central angle of the sector is 100 o. Round to the nearest tenth. 94) A cathedral window is built in the shape of a semicircle as shown. If the window is to contain three stained glass sections of equal size, what is the area of each stained glass section? Round to the nearest square foot. 95) Find the area of the shaded segment of circle O to the nearest tenth of a square unit. The radius of the circle is 6 units. The perpendicular from O to the chord joining point A to point B measures 4 units. 96) Alison is jogging on a circular track that has a radius of 140 feet. She runs along the track from point R to point N, a distance of 230 feet. Find, to the nearest degree, the measure of minor arc RN. 97) In circle O, the radius is 4, and the measure of minor arc AB is 120 o. Find the length of minor arc AB to the nearest integer. 98) When she is outdoors, Tasha, the dog, is tied to a stake in the center of a circular area of radius 24 feet. The angle between her dog house and her favorite hydrant is 165 degrees. What is the length of the arc from her dog house to the hydrant, following minor arc DG, to the nearest foot. 99) In circle O, the radius is 4, and the length of minor arc AB is 4.2 feet. Find the measure of minor arc AB to the nearest degree. 17 100) Write an equation of a circle with center (1, -3) and radius ) What is the equation of a circle whose diameter is 24 and whose center is at the origin? 102) What are the coordinates of the centers of the following circles? a) (x+3) 2 +(y-5) 2 =16 b) x 2 +(y+7) 2 =11 103) True or false: the point (1, 2) is on the circle whose equation is (x-2) 2 + (y+1) 2 = ) The center of a circle represented by equation (x-2) 2 +(y+3) 2 = 100 is located in which quadrant? 105) Graph the circle (x-3) 2 +(y+1) 2 = ) Write an equation of the graph of the circle shown: 107) What is the center and radius of the circle represented by x 2 + y 2-4x - 6y + 8 = 0? (HINT: Convert to center-radius form by completing the square) 108) A rhombus has an area of 24 m 2 with one of the diagonals 6 m. How long is each side of the rhombus? 18 109) A right triangular prism has the dimensions shown. What is the lateral area of the prism? 110) The volume of two cubes is in the ratio of 8 to 64. What is the ratio of the surface areas of the two cubes? 111) How does the area of a rectangle change if its length is doubled and its width is unchanged? 112) The coordinates of the vertices of a rectangle are (-3, 5), (-3, -4), (2,5), and (2, -4). Find the area of this figure. 113) Find the area of the figures. a) Answer in simplest radical form: b) The figure is a regular pentagon: c) Circle with diameter 8 (answer in terms of π) d) The figure is a parallelogram: e) The figure is a trapezoid: f) The figure is a rhombus where AB=5 24 and AC = 8: ) A parallelogram has a height that is 2 in. less than the length of the base. The area of the parallelogram is 48 in 2. Find the height. 19 115) The floor of a dining room is in the shape of a series of regular octagons. One octagon has a side length of about 9 feet and an area of about 100 square feet. Find the area of a smaller octagon, to the nearest foot, that has a perimeter of about 24 feet. 116) Find the volume of the figures: a) The figure is a right cylinder. Answer in terms of π. b) The figure is a right square pyramid. c) The figure is a right cone. d) The figure is a right trapezoidal prism. 3 ft 3 ft 9 ft e) A right cylinder with length 24 ft and diameter 10 feet. Answer in terms of π. 5 ft f) A sphere with radius 3 ft. Answer in terms of π. 117) Find the surface area of the figures: a) The figure is a right cone. Answer in terms of π. b) The figure is a right cylinder. Answer in terms of π. c) The figure is a sphere. Answer in terms of π. d) The figure is a right rectangular prism. 18 m e) A square pyramid with a slant height of 18 cm and a lateral area of 216 cm. Find total surface area. f) Find the lateral area of the prism. Answer in terms of π. 118) Two rectangular prisms are similar. The measures of two corresponding sides are 4 cm and 5 cm. What is the ratio of the volumes of the prisms? Tips for Revising Working in 2 & 3 dimensions Make sure you know what you will be tested on. The main topics are listed below. The examples show you what to do. List the topics and plan a revision timetable. NCERT. The coordinates of the mid-point of the line segment joining the points P (x 1. which is non zero unless the points A, B and C are collinear.